On a happier note than the last post, I have received notification of two recorded talks that are due to be broadcast on Panel Borders, the UK internet radio show about comics (hosted by Alex Fitch). 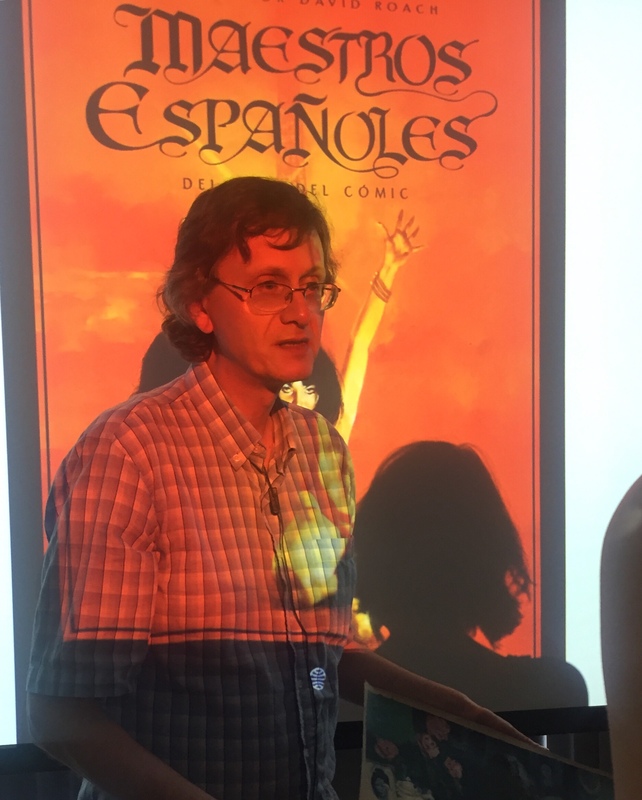 Comics scholar Mel Gibson interviews Anne Digby, the author of the Trebizon novels, who was also the writer of a variety of strips for Tammy. I am very sorry to post the news that John Armstrong has just died. John Freeman from the DownTheTubes website has put together a tribute post, and additionally the site has got an interview “In His Own Words” detailing John’s comics career. Lew Stringer has also posted a tribute on his blog, with some great art samples included. 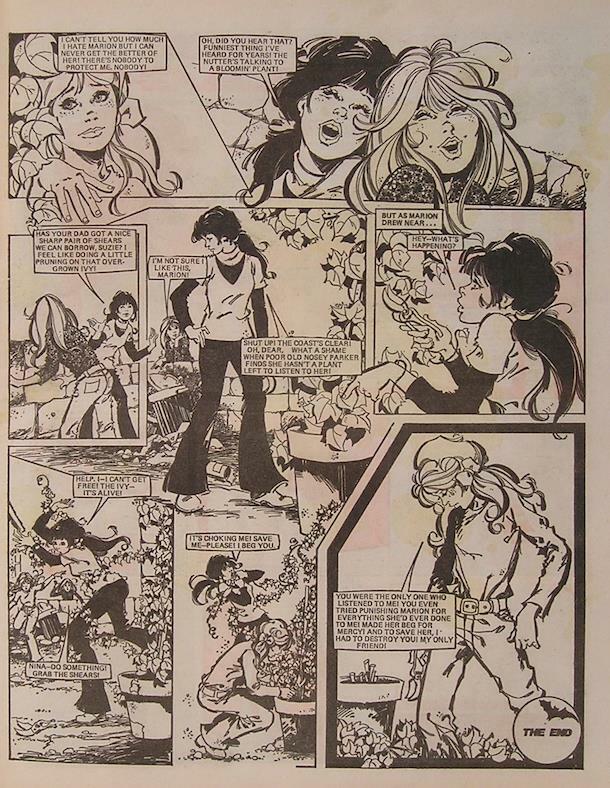 John Armstrong was a fantastic artist with an instantly recognizable style and great strengths in the key elements of girls comics. I am very glad that the Rebellion reprint of Bella came out in time for him to (hopefully) know that his work was being properly appreciated once again. 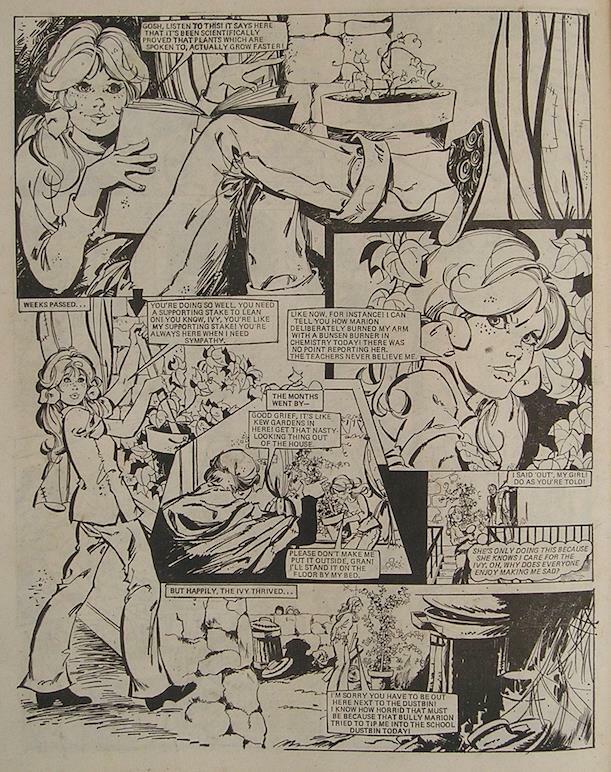 Roy Newby is thought to have drawn only only a few stories in Jinty, but he was certainly a long-running artist in other girls’ comics titles, particularly Girl, where he drew “Robbie of Red Hall” for many years. 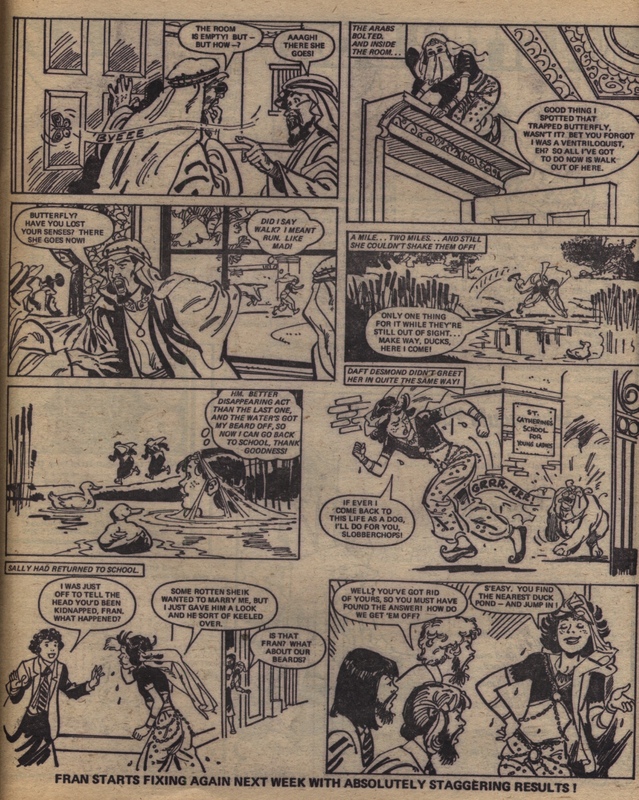 I do not yet have a fuller comic bibliography to list in this post, but on the UK Comics Forum, mention is also made of a story in the second Girl Annual which is specifically credited to him as artist: “Late For Dancing”, written by George Beardmore. 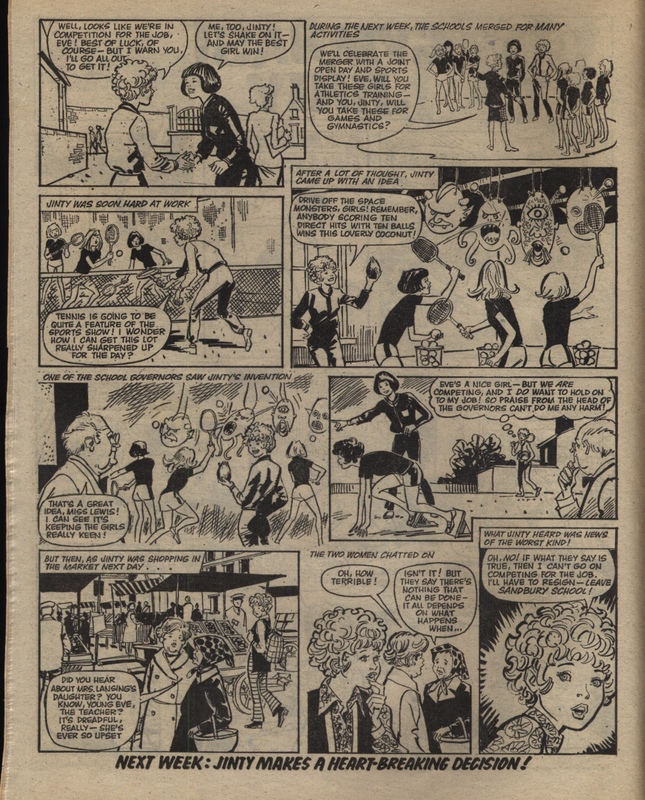 Additionally, comics newssite Down The Tubes states that Newby worked on stories that appeared in other titles such as Tammy, Poppet, Judy, and Valentine. Newby died relatively recently, having lived to the age of 98; the obituary in the Guardian, written by his son Mike, can be seen here. Mike Newby has likewise created a dedicated site showing his work (though not including many examples of comics, unfortunately for us). Finally, the Lambiek Comiclopedia has a little more on him here. When researching this post, I got in contact with Mike Newby and his sister Clare, who shared some memories with me. Mike told me that “…Dad’s original artwork for his comics was destroyed by the publishers as soon as they’d done the necessary for a print-run. (What a shame!) But Dad kept pretty much everything in printed form. He’d go and buy that week’s edition of whatever comic he’d drawn and stick it in a scrapbook.”. 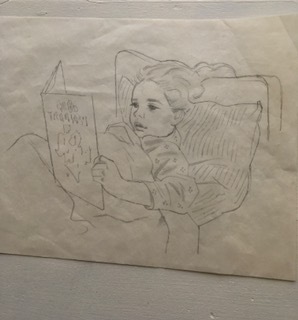 Courtesy of Clare Newby, here are two images of her father’s work – a photograph of some of the scrapbook pages, and a beautiful little sketch of herself reading them in bed, when ill at one time. Many thanks indeed to her for sending those in! 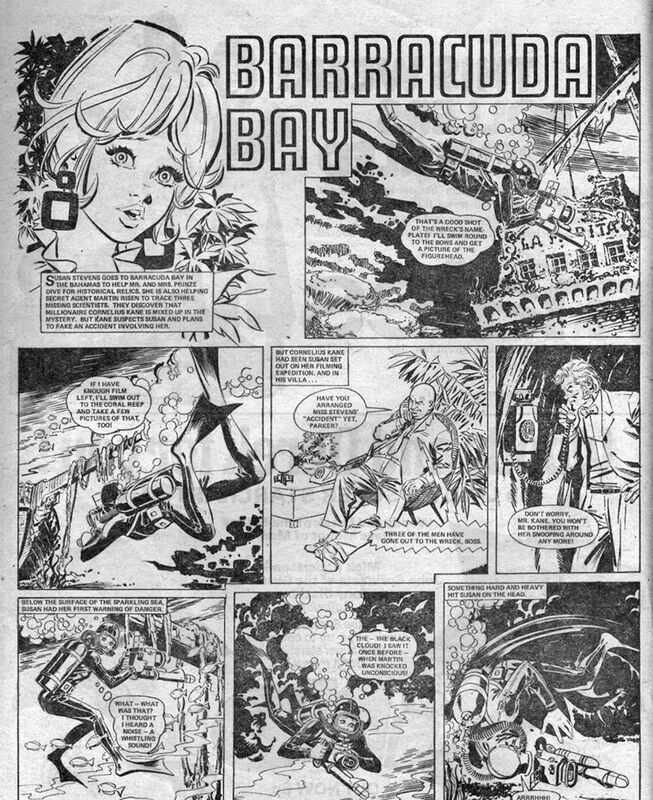 It was very sad to hear the news today that Jim Baikie has died, aged 77. It seems that he had been in declining health for a while – I had asked around previously to see if there was a chance of interviewing him for this blog but was given indications that this would not be very likely. The page on this blog about him outlines his contribution to Jinty in particular, but since the time that that post was written, we have widened the scope of this blog to cover earlier titles such as Sandie (where he drew humour story “Our Big BIG Secret”) and June & School Friend (where he drew “Gymnast Jinty”). He was truly an all-rounder in girls’ comics. In tribute, below you can find some pages of his art brought together. Fran the Fixer (with false beard) vs Sheikh Abbis. Jinty 21 October 1978. The first real flowers the townsfolk have ever seen. From “The Forbidden Garden”, final episode, 28 July 1979. We have run a few posts about Alan Davidson before now on the blog, but not a complete summary post that serves as an appreciation of his work. 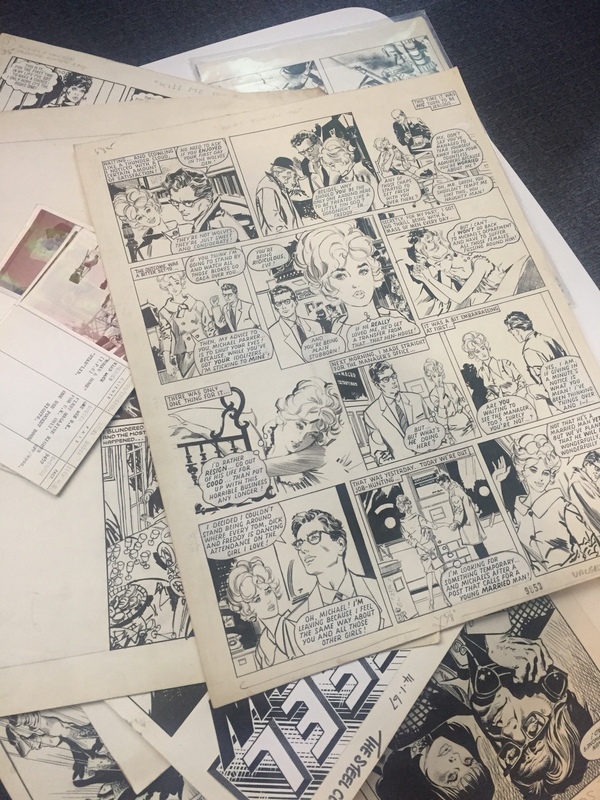 Of course no summary post can be properly complete at this stage as we do not know all the stories he wrote for girls’ comics – his wife Pat Davidson has mentioned that he kept careful copies of his invoices and his scripts, but to go through those files is itself a lot of work. We can hope that we will hear more titles of stories in due course, and if so, I will certainly add them into this post. 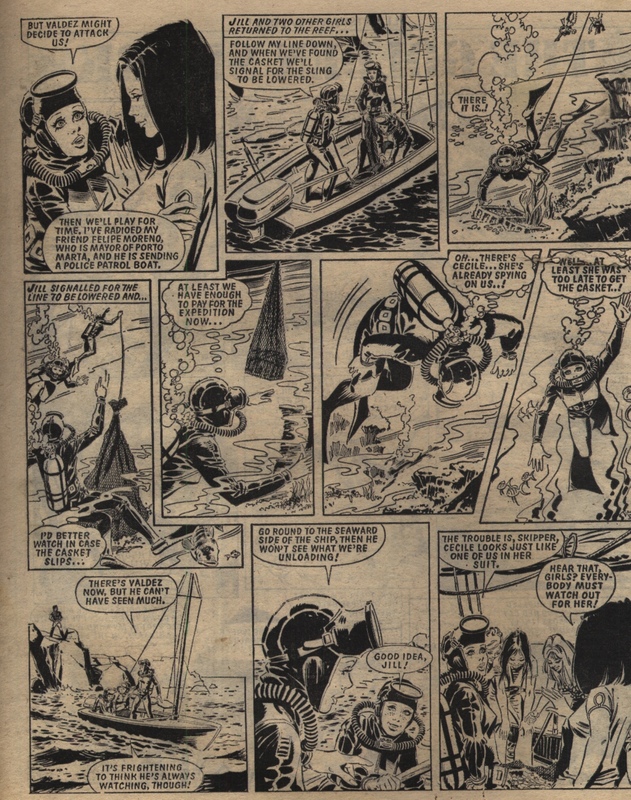 In any case, we now have story posts about all five of the Jinty stories that it is is known that Alan wrote, so the time seems right for an appreciation of him as a comics writer. 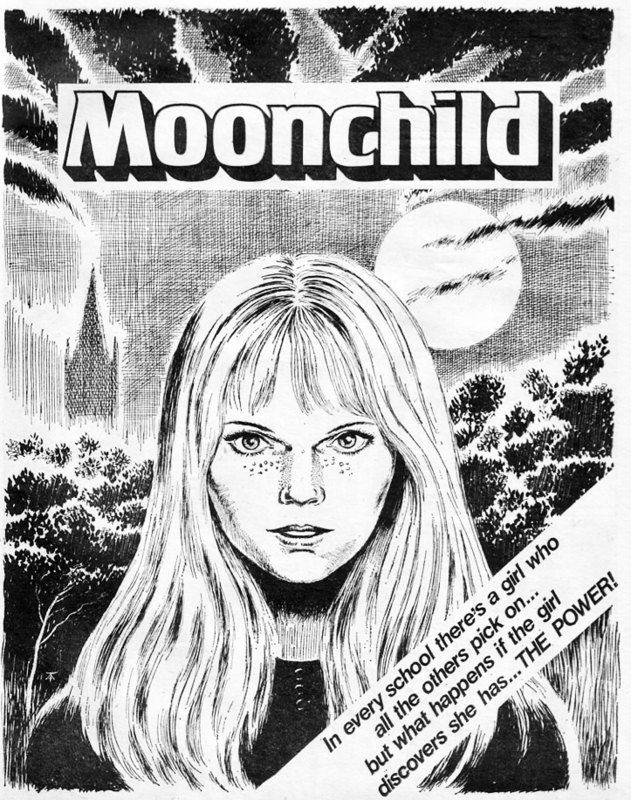 Having set down these initial bibliographic details, what can we pull together in terms of an appreciation of his work, in girls comics and elsewhere? 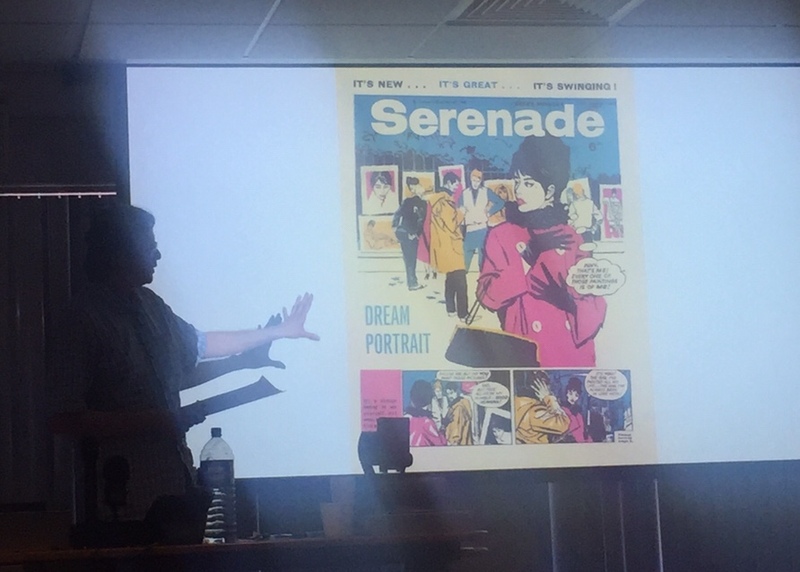 Davidson’s work is not as strongly themed as Alison Christie‘s concentration on heart-tugging stories which forms the bulk of her comics writing. 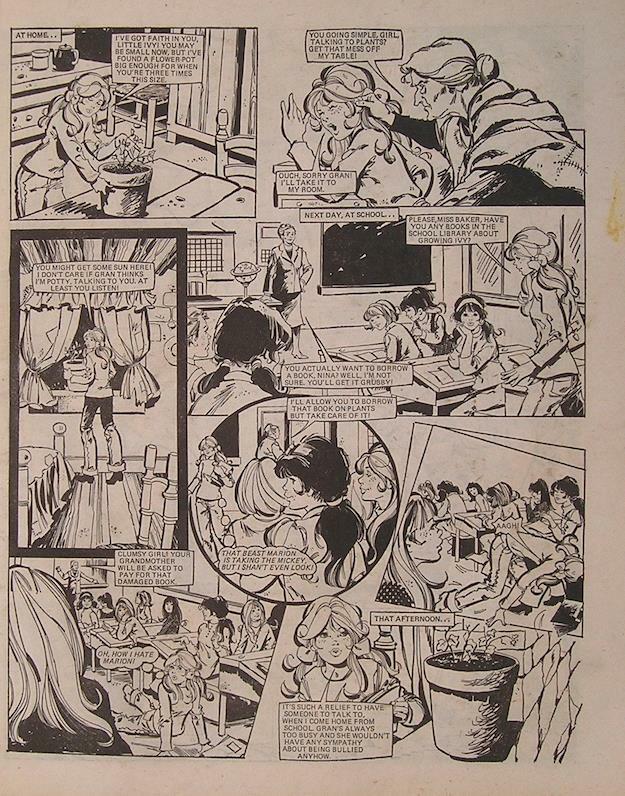 There is a clear focus on wish fulfillment in his Jinty stories: Gwen stumbles into a position where her schoolmates respect and appreciate her as she has always wanted, Jackie is swept up by a rich mother-figure who is prepared to take her away from her life of poverty, Debbie finds a mysterious valley and within it a sort of fairy godmother who will save her from her cruel family, and Kerry is likewise swept up by a rich mentor who looks like she is a route to the fame that Kerry has always wanted. The wish in question is almost always double-edged or positively treacherous: Debbie is the only one who ends up happy with getting what she has always wanted (and of course her fairy godmother figure is stern-but-kind rather than seemingly kind but morally dubious). However, Davidson plays the theme of wish fulfillment while ringing the changes: none of his stories are close repeats, even though they have this similar focus. 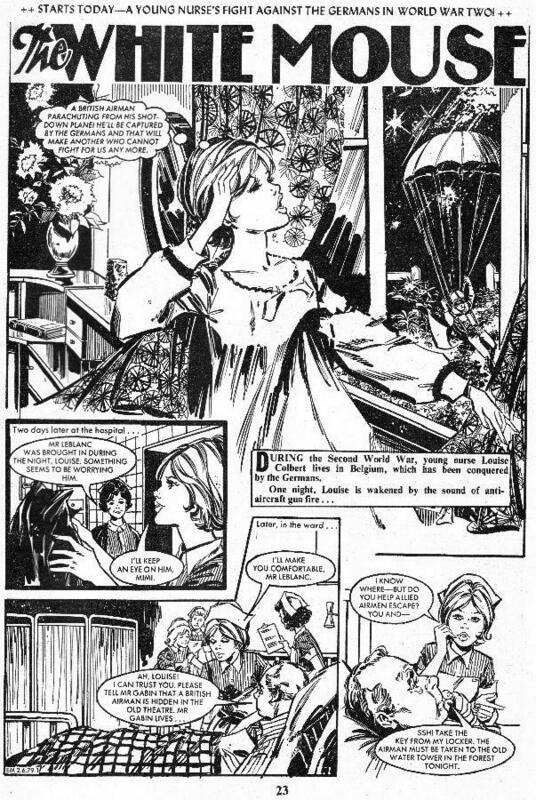 Davidson of course had also previously written a standout story that gave girls’ comics a key new theme: 1971’s “Little Miss Nothing” started the run of Cinderella stories which gave Tammy its reputation for cruelty and darkness. 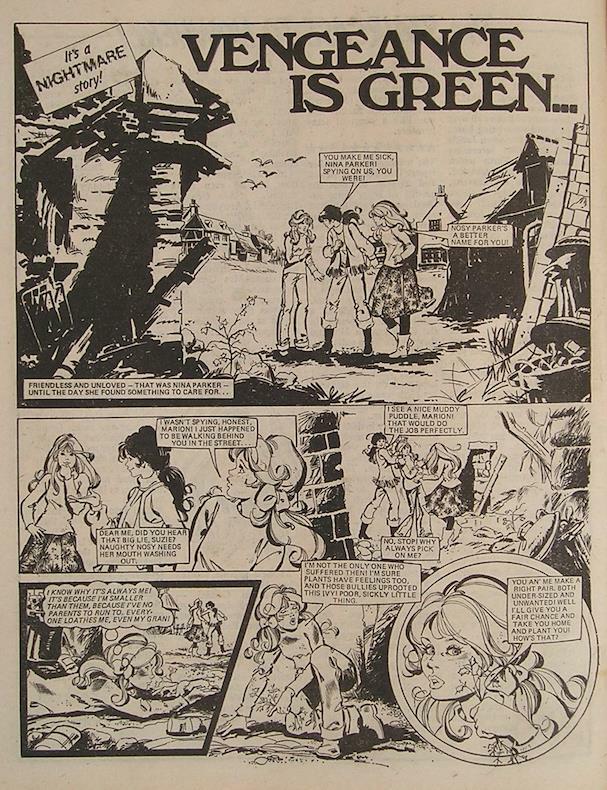 Pat Mills has lauded this as being written with a real lightness of touch and being written very much from the heart (note that he thought at the time that this was written by Alan’s wife Pat, which has since been corrected by Pat Davidson herself). We know less about what we wrote for titles other than Jinty: it seems he wrote little else for Tammy (unless Pat Davidson can correct that impression? ), and only one story for Misty. 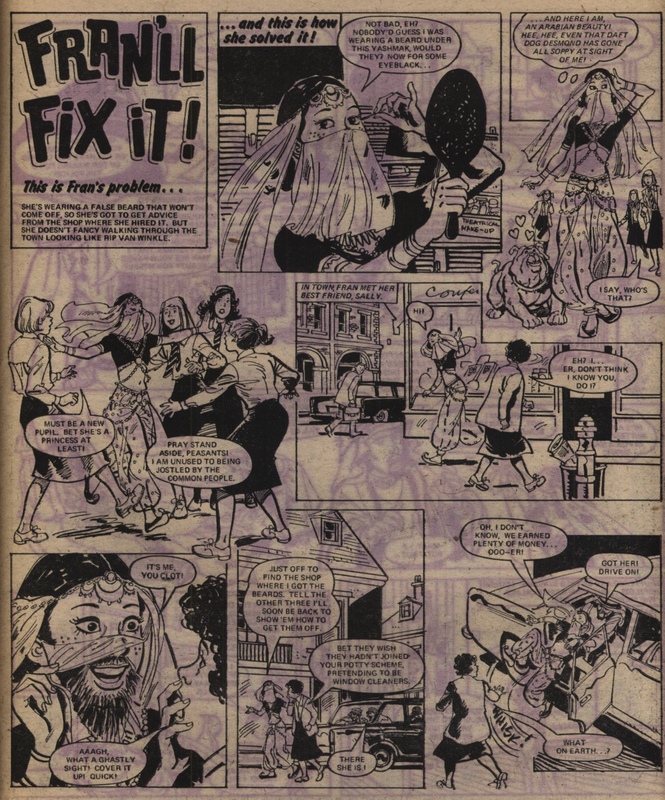 “Paint It Black” was part of the opening line-up of that comic. While it was a compelling read it doesn’t seem to have struck the same chord with readers as some others from that title, and Davidson doesn’t seem to have written more for Misty (perhaps also due to the fact that he was finding success in children’s prose fiction from around that time). It’s clear that Davidson’s writing is strong all round, and at its height was really mould-breaking (not just once, at least twice). 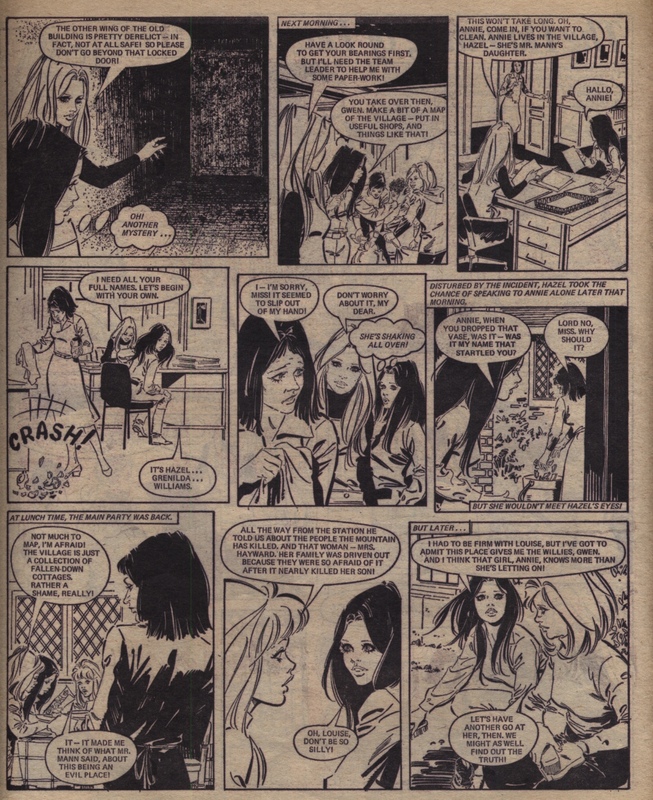 There are ways in which it follows the conventions of girls comics writing reasonably closely: the titles of his stories tend to follow the standard set up of focusing on the girl protagonists (Gwen, Jackie, Fran, Kerry) though veering away from that in some cases (“Valley of Shining Mist” and most particularly “Paint It Black”). I’m not sure whether this all-round strength is part of the reason for another aspect of his comics career which I was struck by when looking back – he has not been associated with one particular artist, but rather been illustrated by a wide range of artists with no repeats that I know of. 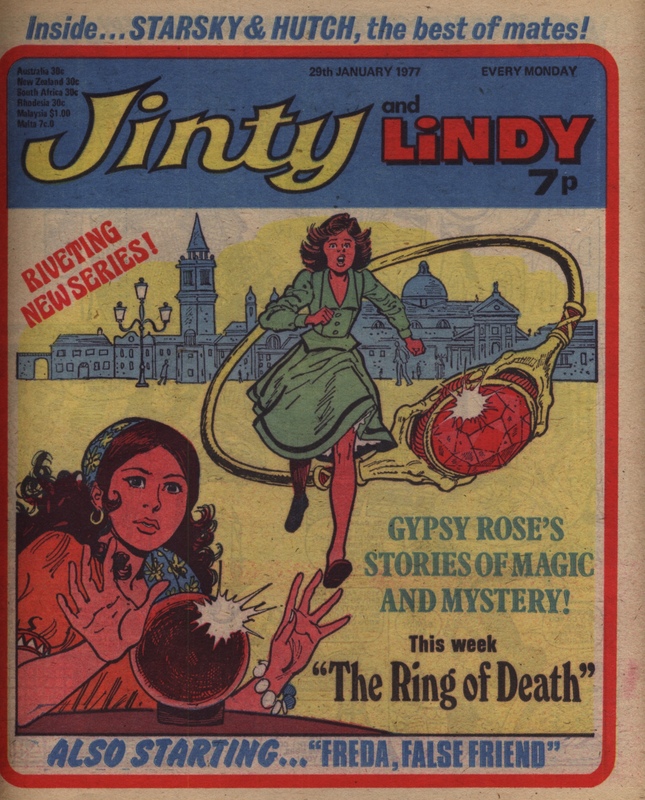 This contrasts with the partnership between Alison Christie and Phil Townsend, who created some seven very popular stories together for Jinty. From the mid to late 70s, Davidson started to concentrate on prose fiction for children. It’s a little hard to search for details of his work online as he doesn’t seem to have had his own web presence and there are a few other well-known figures with the same name (such as a food writer and a cricketer). This Goodreads author page is the clearest list I have found of his prose works, while it’s also worth looking at his Wikipedia page, which tells us that he started off as a subeditor on “Roy of the Rovers” for Tiger. 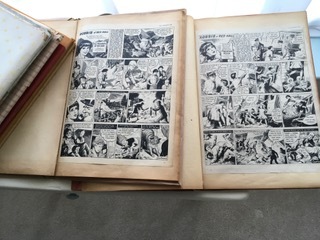 Writing children’s prose fiction has clear advantages over continuing in the world of juvenile comics: better recognition by your public rather than having no printed credits in the pages of the comics titles, better rewards for success in the form of royalties and translation money. At the same time, his most successful prose work, “The Bewitching of Alison Allbright”, is an effective re-working of his popular comics story “Jackie’s Two Lives”. The influence of the earlier writing clearly informs the later work too: what comics loses, children’s fiction gains. 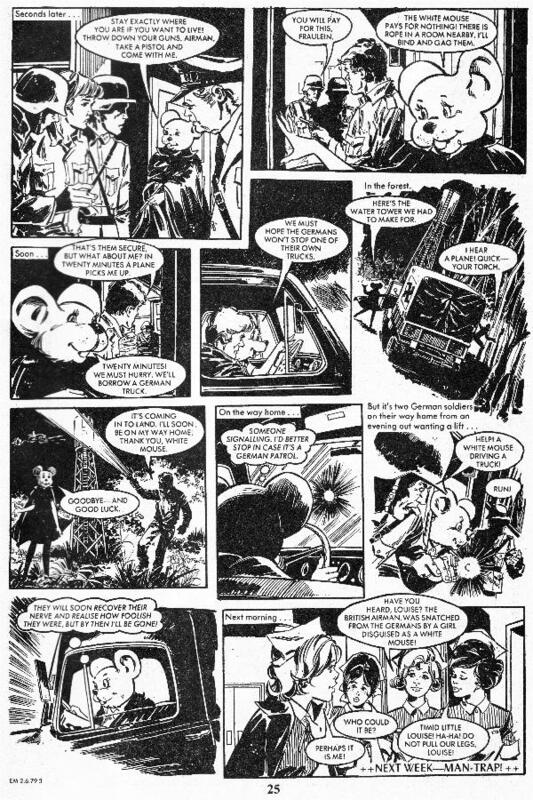 If Davidson had been writing a decade or so later, might he have been swept up in the popularity of 2000AD and the migration that various British creators made to the US market? That only seems to have drawn in the creators working on boys’ comics, so I assume not. 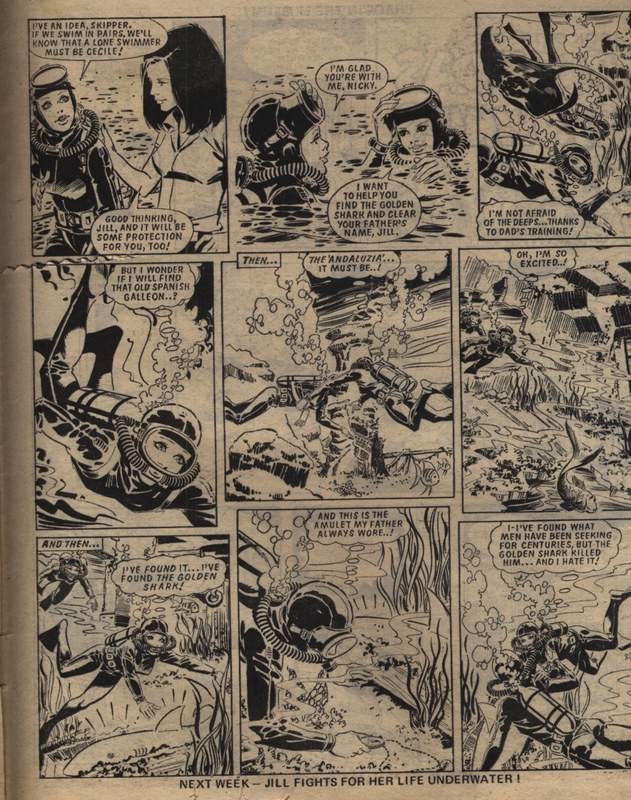 It is pleasant to imagine the talented writers of juvenile comics being fêted and recognized by name in a way that British publishers spent many years fighting to prevent. Ultimately however it is a sad thought: Alan Davidson, who is amongst those who most deserve that name recognition, is only now getting a small fraction of that recognition after his death. 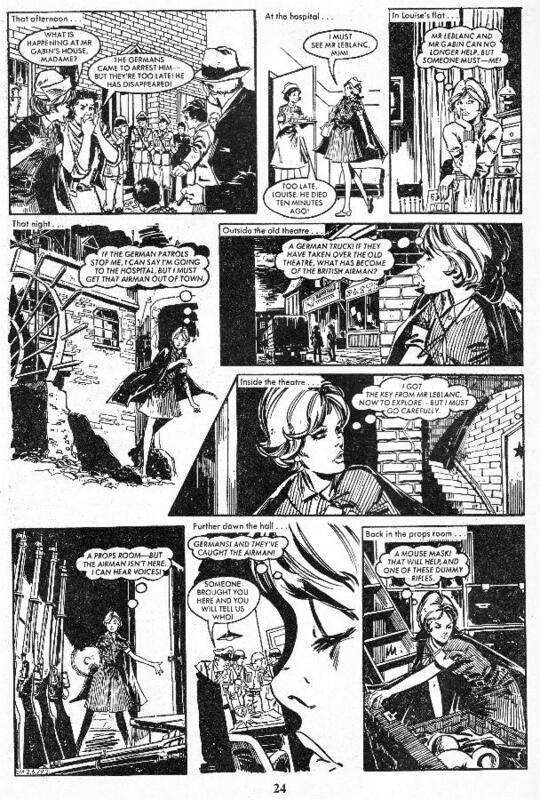 Rhoda Miller was a subeditor at DC Thomson and at IPC, working on girls comics and magazines between 1966 and 2008. In answer to my questions, she wrote the biographical piece below, which I am very happy to be able to publish. Many thanks, Rhoda! I began work in August 1966 on Diana magazine in Dundee. Editor was George Moonie, Chief sub Ken Gordon. There were two other men subs and about four girls. From day one I was expected to write features and was sent out, (untrained!) to interview people such as The Walker Brothers, Amen Corner, Davy Dee, Dozy, Beaky Mick and Titch (?). Story ideas were discussed at “story sessions” and ideas sent out to script writers. The subs’ job was to prepare them for publication. Sometime, this meant a complete re-write! In 1970, I was in a one-way love affair and decided to move to London. A bit drastic, but there you go! When I applied to IPC they had just paid off a lot of people and the unions wouldn’t let them take anyone new on. But John Purdie was keen to have someone from Thomsons, he took me on as a free lancer, but I was to work in the office full time, and if anyone asked, I was to tell them I was a “visiting free lancer”. I was put in Desmond Pride’s old office with Annie Deam, who had recently been removed from her post of School Friend editor, and like me, was working on projects. Eventually I went onto Sandie and worked as a sub. My days of working there are very hazy, and I wasn’t there very long before personal circumstances propelled me back to Dundee. I do remember the art editor, though. 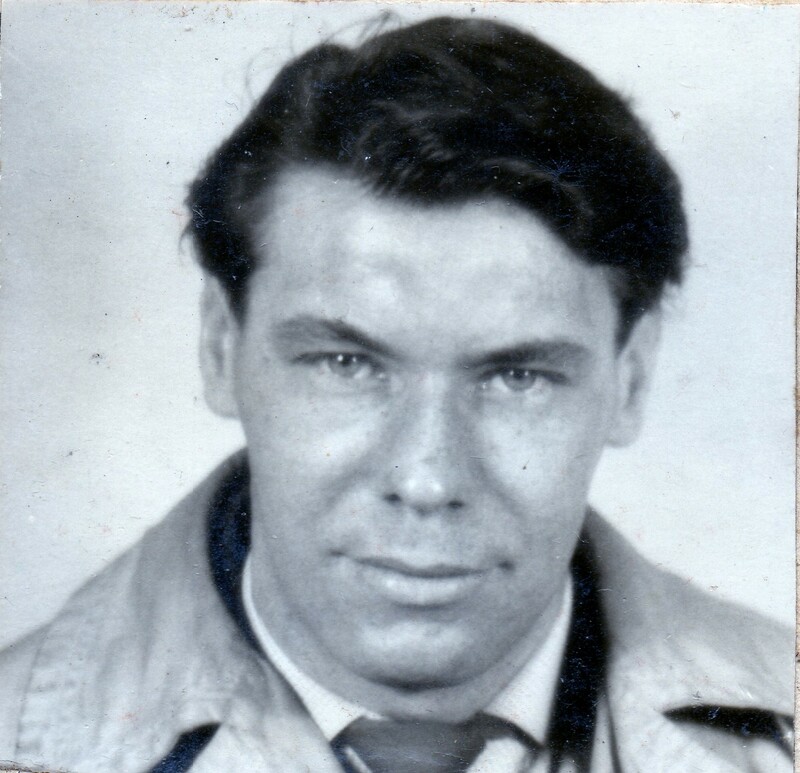 His name was John Jackson, and he had come from Eagle, and I remember the artists agent, Jack Wall, and his best mate, an artist whose surname was MacGillivray (can’t recall his first name) [Robert MacGillivray] but MacGillivray’s nephew was the legendary Ali McKay who also worked for IPC for quite a few years. Back in Dundee, I rejoined DC Thomsons, and went to The Bunty, where Harold Moon was editor, Ian Munro chief sub. These were amongst the happiest days of my working life. I was there for several years, writing scripts for “The Four Marys” among others. At this time, the company still employed several long-standing script writers. One of the most prolific was a lady called Olive K Griffiths. Her scripts needed a lot of re-writing, as I recall. In the weekly comic we didn’t have features, but we did in the annuals, and these the staff were required to write. After that, it was Spellbound with Ken Gordon editing, and David Donaldson chief sub. By this time, some of the subs were writing more and more of the scripts, and the company was employing fewer outside script writers. Spellbound, a spooky magazine, only ran a few years before it ran out of steam. I remember we had a lot of interference from Norman Fowler, who was one of our managing editors. He was keen to have horse racing stories in all the magazines! 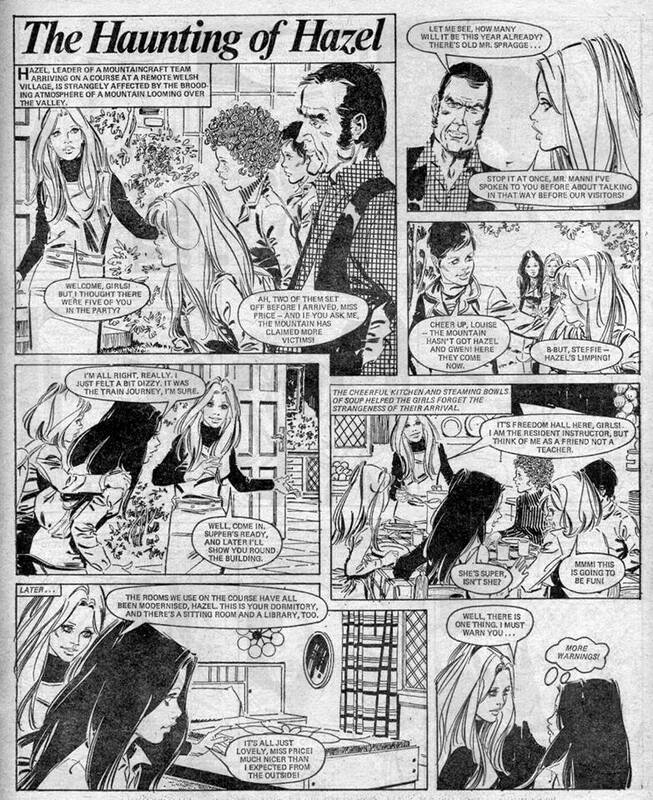 After Spellbound, it was Mandy under Alan Halley, but when I objected to him wanting to run a horrible story about a wealthy couple planning to kidnap a poor girl and use her as a blood donor for their ill daughter, we fell out and I went to Nikki, where I wrote “The Comp”. As I say, my memory is not great for dates, or how long I was on each magazine, but in 1997, I was chief sub editor on Animals and You. Frances O’Brien was editor. “Luv, Lisa” was my idea, and was quite an innovative idea, as it was a “dear diary” photo story rather than an illustrated one. Richard Palmer was the photographer (he also worked for IPC). After Animals and You, Frances and I moved to work on a new project, of which nothing came, but we did come up with the concept of The Goodie Bag Mag, and I worked on that with her, until I took early voluntary severance in 2008. 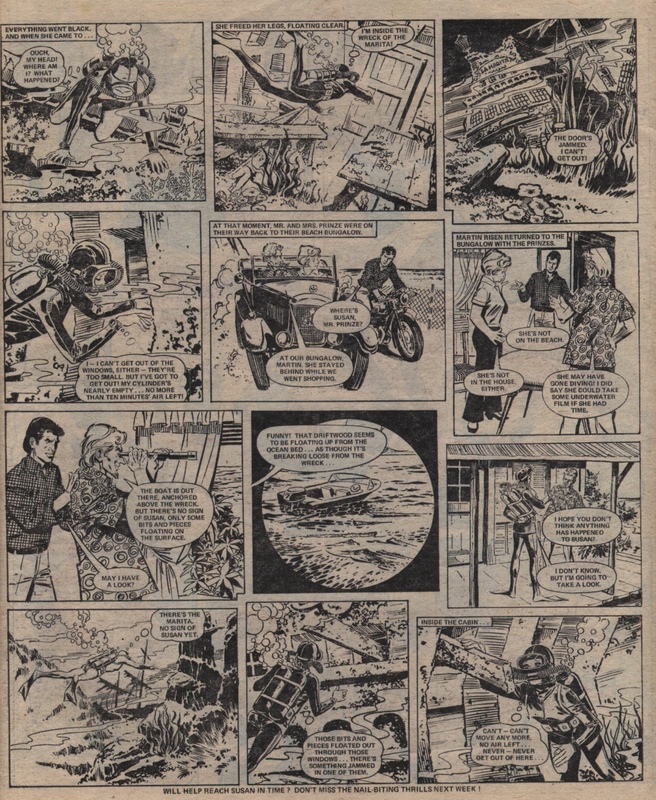 As to naming the script writers/artists, it was certainly a DC Thomson policy not to allow anyone to be credited. But some of the Spanish artists sneaked their names on and a blind eye was turned. Mainly because they were indispensable. Indeed, it was only in the past twenty years that Thomson allowed their newspapers reporters and columnists to get bylines!